Windy Corner Magazine is a new ongoing series filled with comics and writings about comics. Edited by cartoonist Austin English, each issue will feature serialized episodes of English’s “Life of Francis” and “My Earliest Memory” stories. The first issue also showcases an in depth interview with cartoonist Andrice Arp, paintings by Paula Salemme, an essay on art school by Steve Lafler, and a stunning 10 page comic about Saul Steinberg from “Lumakick” artist Richard Hahn. 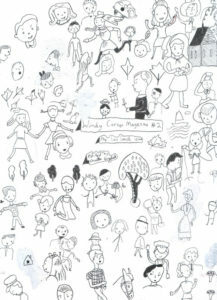 Windy Corner Magazine will be an ongoing outlet for cartoonists to write about (and draw about) the art of cartooning. Interviews in every issue will employ artists interviewing artists about the nuts and bolts (technical and mental) of drawing. Commissioned comic strips by one artist about a stylistically similar master will also be a regular feature. This full color issue of Windy Corner presents the continuing chapters of Austin English’s two graphic novels: Life of Francis and My Earliest Memory. This issue opens with art by Mollie Goldstrom, an illustrated table of contents by Elisabeth Timpone, short comics by Fiona Logusch and Dylan Williams, and in depth interview with John Hankiewicz by Onsmith. A new issue of this classic modern comic art magazine. 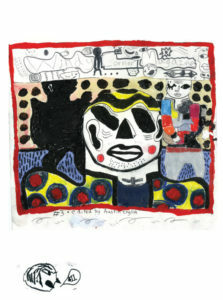 This issue is, as usual, edited by Austin English who takes a curatorial approach to the task. Lilli Carre makes a phonecall. Molly Colleen O’Connell introduces everyone. Austin English moves in and buys paint. Then he lives at Bernal Heights, draws and watches a daughter walk down some stairs. Sakura Maku is at a dance in full color. Jason T. Miles paraphrases Jesse McManus. Garth Williams draws close for everyone. Frank Santoro watches a band very closely and takes notes. Vanessa Davis and Carol Tyler talk at different speeds. Joseph Hart builds us something as we depart. Dylan Williams takes all of it and molds it into a book and here it is. 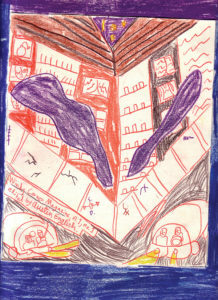 “At first glance, the debut issue of Windy Corner Magazine may look like something your kid made one afternoon in art class. And that’s okay, because subverting your expectations only will open your mind to be accepting of all of this indie effort’s innumerable charms.